It’s hard enough for any young person to leave the family and home country in order to broaden their horizons, let alone if the impending challenge entails waking up as early as 4.30 a.m. ahead of a gruelling training session in the pool. That’s the commitment Matthew Zammit has just undertaken as the young swimmer flew to England earlier this month to take up a scholarship at Plymouth College. Showing a maturity beyond his age, the 16-year-old Zammit had long made up his mind to pursue his sixth form studies and swimming career in the UK. Securing a scholarship at Plymouth College was anything but a straightforward task but, backed by the unflinching support of his parents Alan and Sandra, Zammit has reached his initial aim. 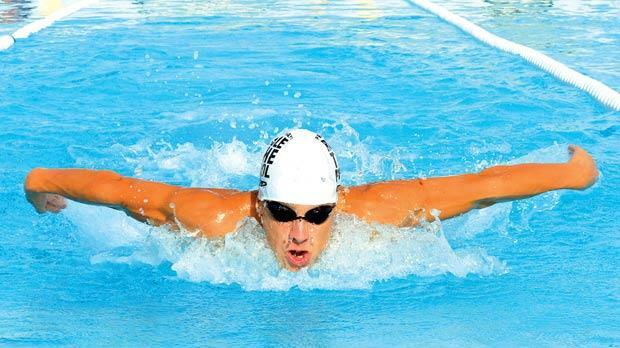 Besides sending his times, dvds of him swimming and results of his GCSE exams, Zammit underwent a test at Plymouth College as their trainers wanted to gauge his potential. He also sat for exams, prepared by the lecturers at Plymouth College, in mathematics, english and biology. “I wanted to manage my swimming and school commit-ments better,” Zammit said. “I’m striving to improve my time-management. “In Malta, if you are finding it difficult to cope with your academic and sporting commitments, people don’t really understand your problems. At Plymouth College, if you miss one day at school, the teachers come to the residence to help you catch up. Zammit’s passion for swimming motivated his decision to pursue a scholarship in the UK. “Last September, I was already thinking about taking my swimming career to another level,” Zammit said. “I decided to apply for a scholarship and received favourable replies from some schools but the choice boiled down to which college had the best swimming programme. Besides swimming, Zammit also showed promise in athletics and, for some time, he was in a dilemma as to which sport to focus on. “I’ve been swimming since I was a young boy,” Zammit said. “I also used to do athletics. Since athletics is daddy’s sports (Alan Zammit is a former sprinter and football goalkeeper), it was like ingrained in me. I did take part in athletics competitions but I wasn’t sure if it was the best sport for me. A holder of several age-group records, Zammit was with Neptunes until last year and in June, he was selected to form part of the national squad. “In England, Zammit is turning out for the swimming team of the Plymouth College, Plymouth Leander. While Zammit is prepared to adhere to a rigorous schedule, his parents are absorbing the financial burden of his stay in the UK. “We tried to look for funds but received little support so far,” Sandra Zammit, Matthew’s mother, said. “We were told that there’s no scholarship funding for youngsters of Matthew’s age. Never mind the motto ‘catch them young’. “The Kunsill Malti għall-iSport have promised to help us and we’re hopeful of receiving further assistance in the near future. His dream is to compete and do well in future Olympics. “The Maltese mentality is that our chances of going to the Olympics are very remote but I want to try and reach that goal,” Zammit said. At the conclusion of our interview, Zammit expressed his gratitude to the teachers of San Anton School and all those who have assisted him throughout his tough training schedule.